Use this convenient, pocket size, probe to check voltage within four ranges from 80 - 480 V AC/DC. 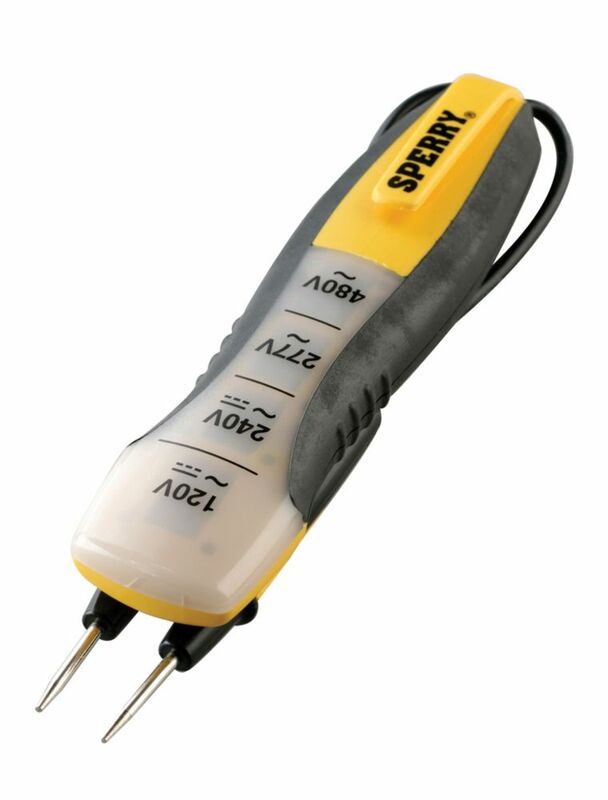 Tester features a special patented design including five inch test leads that snap into the probes built-in lead storage clips. The storage clips are preset to standard wall outlet spacing allowing the user to test with just one hand. The ergonomic shape and soft grips provide comfort over long-term multiple uses while the high visibility LED voltage indication light ensures quick and accurate reads. Pocket clip allows user to clip onto shirt or belt with ease. Tester features Hi-impact ABS housing to withstand drops of up to up to 10 feet and a crush rating of 250 pounds. CULUS/CE Listed with a CAT II 600V rating. Operating temperature range of 32 F - 104 F (0 C - 40 C). Limited lifetime warranty. The Extech EX320 is a compact auto ranging multi meter, features extra-large 2000 count display and built-in non-contact AC Voltage detector. Meter also features continuity, diode test and max hold functions. Rubber holster protects meter from dirt and debris. UL listed, Cat III 600 Volt. Includes test leads, two AA batteries and tilt stand. The MP530A is a 5000 count, True RMS auto Ranging Multimeter which measures AC/DC Voltage, AC/DC current, Resistance, Temperature, Capacitance and Frequency with a 0.08% basic accuracy. Additional features include: diode test, continuity check, easy-to-read backlit display, auto power off, data hold, and low resistance auto lead zero. UL listed, CAT IV-600 Volt rating. Includes protective holster with built-in stand, test leads, Type K bead temperature probe, and 9 Volt battery. 4-Range Voltage Tester, 80-480 VAC/DC, 1/Ea Use this convenient, pocket size, probe to check voltage within four ranges from 80 - 480 V AC/DC. Tester features a special patented design including five inch test leads that snap into the probes built-in lead storage clips. The storage clips are preset to standard wall outlet spacing allowing the user to test with just one hand. The ergonomic shape and soft grips provide comfort over long-term multiple uses while the high visibility LED voltage indication light ensures quick and accurate reads. Pocket clip allows user to clip onto shirt or belt with ease. Tester features Hi-impact ABS housing to withstand drops of up to up to 10 feet and a crush rating of 250 pounds. CULUS/CE Listed with a CAT II 600V rating. Operating temperature range of 32 F - 104 F (0 C - 40 C). Limited lifetime warranty. 4-Range Voltage Tester, 80-480 VAC/DC, 1/Ea is rated 3.5 out of 5 by 2. Rated 2 out of 5 by Kino from Poor quality.... Poor quality. Rated 5 out of 5 by Vegas from Saves a whole lotta time for sure, works great.... Saves a whole lotta time for sure, works great.